this submission is from our friend at Highland Park Hockey. He covers all things WBS Penguins and he attends most games (home and away) on his dime. You can always check out his work on the Pensinitiative home page or at the link above. An injury caused Hartzell to miss the Wilkes-Barre/Scranton Penguins (WBS) 2013-14 season opener and first three weeks of the regular season back in October. Upon returning to the ice, Hartzell was re-assigned by Pittsburgh from the AHL Penguins to the Wheeling Nailers (ECHL) at the end of October and made his first professional start in a regular season game November 1st in a home game with the Reading Royals. His first game didn't not go the way he would have wanted, as he allowed five goals on 30 shots in a 6-2 loss to the Royals. In five games with the Nailers, Hartzell played well with a 2.58 goals against average and .922 save percentage, despite going 2-2-1. His best ECHL performance came in his 4th start on November 14th against Elmira, where he posted his first pro shutout, a 37-save effort, in a 1-0 Nailers win. Winning tight, low-scoring games continued to be the trend at the AHL level upon being called back up to the WBS Penguins on November 18th, following an almost three week conditioning stint for the rookie goaltender. Hartzell's long awaited AHL debut on November 23rd was well worth the wait. 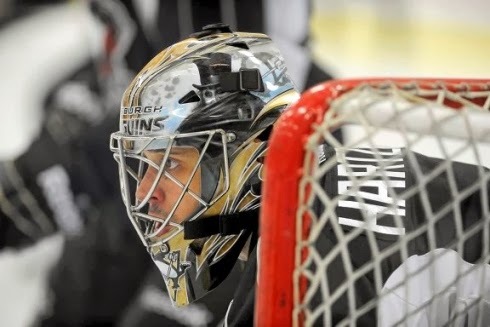 The 6-4, 205 pound goaltender out of Quinnipiac was peppered with shots by the St. John's IceCaps, and with the Penguins trailing 1-0 heading into the 3rd period, Hartzell was a big reason why the game was only a one goal game. He stopped 25 of 26 through 40 minutes, with the Penguins being out shot badly at 26-9 and seemingly over matched. Hartzell was rewarded for his strong play in his debut, as the Penguins went on to strike for five goals in the third period in route to a 5-2 win, Hartzell's first at the AHL level. His second start, six days later against the (at the time) red-hot Binghamton Senators, Hartzell pulled off another clutch goaltending performance, getting his first AHL shutout in a 1-0 win for the Penguins in a 25-save effort. With a great start to his AHL career, there's always going to be some mistakes to learn from as part of that maturing process. Hartzell ran into some of that trouble in St. John's, being tagged for five goals on 29 shots in a 5-0 loss to the IceCaps, a team which Hartzell played well against back in Wilkes-Barre just two weeks prior. Despite that, he continued to play well allowing no more than three goals in any of his next four starts. Hartzell was pulled from action in a game at the end of December, the first time in his pro career, after allowing two goals on three shots in the first period of a game against Syracuse in a game where the Penguins didn't come out ready to play. Head coach John Hynes opted to switch things up and turned to the team's normal starter Jeff Deslauriers, who came in and stopped all 21 shots he faced in a turn-it-around kind of 5-2 win over the Crunch. So just as it seemed that Hartzell was starting to possibly push more for the team's starting bid, heading into January and the new calendar year Jeff Deslauriers was still the clear number one goaltender. Deslauriers started six of the first seven games in January, but in his sixth start on January 18th in Rhode Island against the Providence Bruins, the first game of the team's six-game road trip, the trouble for Deslauriers began. He was pulled from action after allowing his 4th goal on 26 shots about midway through the third period. Hartzell finished the game and got the start the next night in Maine against the Portland Pirates. Hartzell responded with a 4-2 over the Pirates and a win the next night in a rematch with the Bruins in a 5-1 decision in favor of the Penguins. With a week off before the next three-in-three, the Penguins coaching staff had plenty of time to think about who start on last Friday night in Norfolk against the recently surging Admirals. Still, the Penguins rolled with their number one goaltender in Deslauriers in hopes he would bust out of his recent funk. After allowing two goals on seven shots in the first period and a confrontation in the crease with Admirals forward Zack Stortini after a lack smack at the Pens goaltender after a whistle, things seemingly boiled over for Deslauriers. With just over six minutes played into the 2nd period, and a timeout on the ice for a media break, the teams convened at their benches like they normally do. Deslauriers and Admirals goaltender John Gibson seemed to have exchanged words at center ice during the timeout. As the goalies headed for their nets, which in the second period means their paths cross, contact was made and the two goalies squared off in a quick wrestling match that started a frenzy on the ice. Deslauriers was assessed a double minor for roughing, a fighting major and a game misconduct which resulted in an ejection. He hasn't played since. Once again, Hartzell was thrown into the middle of the action. He finished the game and got the start against Norfolk the next night out, winning with a spectacular performance stopping 33 of 34 and all eight attempts against him in the shootout. Hartzell even got the start Sunday in Hershey after playing the night before and following a six hour overnight bus ride for a 5:00 p.m. EST just 12 hours later. Last night, it was Hartzell leading the Penguins out for warmups to start this week's worth of games. With games Friday and Saturday, and several three-in-threes coming heading down the stretch, both goaltenders will play. But if the last week or so has been any indication, Hartzell is making a strong push to be the team's number one goalie.